Spring has been known as prime real estate season for many years. If you plan to purchase a home this spring it is good to know what to expect while you are shopping for a home in peak season. 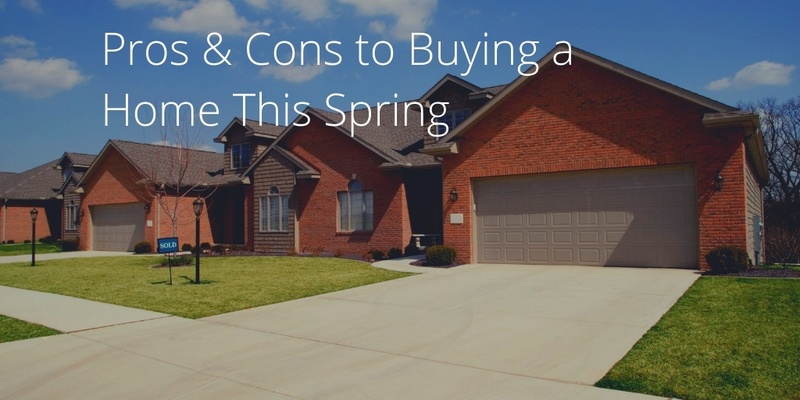 Consider these spring home buying pros and cons as you begin your home buying adventure. One of the best, or possibly THE best reason to purchase a home in the spring is that there are more homes to choose from. Many homeowners will wait until April or May to list their home as many market analysis has shown. Tip: Stick to your search and price criteria to avoid getting overwhelmed with all the inventory out there. With a higher inventory of homes comes a higher volume of home buyers. More buyers looking means more offers and more competition. Bidding wars are not uncommon in the spring. With the higher possibility of multiple offers on homes, buyers will need to move more swiftly in making an offer when they find a property that meets their wants and needs. It is super important to find an expert local agent to help you find homes as soon as, or even before, they hit the market. When the weather is pleasant and the homeowners are busy and able to be out of the home it is much easier to hold an open house. Attending an open house gives you more time to get a feel for the home and the neighborhood it is in. Multiple open houses in the same neighborhood will also help you get a better feel for the area and help you determine where you want to live. In hot markets, homes in great condition at reasonable price points sell very quickly all year long. When there are a peak number of buyers the selling process moves all the more swiftly. If you find a home you love but are still nervous making an offer on taking that extra time to thinks things through could cost you. It is crucial in a busy market to really know exactly what it is you want in a home and how much you are willing to pay for it. Getting pre-approved for a home loan really helps here. Pre-approval helps you to know your limits and also helps to put your offer at the top with a home seller. Sellers like the reassurance that funding will not be difficult for a buyer to obtain. While not the biggest of pros, having better weather to search for homes is better. It is not a complete deal breaker to search for a home in cold, wet or even snowy weather, but it is so much more pleasant to search for homes in the sunshine. Another bonus: better moving weather. Generally, there is more wiggle room to make a lower offer on a home in a slow market than in a peak season like the spring. Be prepared to pay full list price for a home that is listed at or near to fair market value. In addition, be prepared to pay full list price you may want to offer the seller something extra to rise above other offers. This could be something like a longer closing, paying a larger portion of closing costs, or being able to close more swiftly. Having a great agent will help you here as they can communicate with the listing agent to find what the seller is really looking for. The spring can be a busy peak season to purchase a home, but with the right preparation and a great real estate agent, you can find a great home.